We currently accept Visa, MasterCard, American Express, and Discover. When your credit card is authorized, funds are put on hold until the transaction is completed. Your billing information must be exactly as it appears on your credit card statement. For security purposes, we may require you to enter your 3 or 4-digit card identification number (CID/CVN/CVV/CVC) for Visa, MasterCard, American Express, and Discover credit cards. Authorization charges typically clear within 1-3 business days. If you have questions regarding authorization holds for attempted orders, please contact your financial institution for more details. * Please note that we do not accept international credit cards. 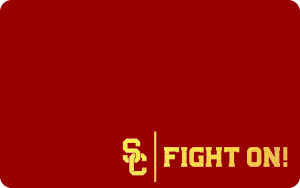 We only take credit cards, debit cards & USC Bookstore Gift Cards/eGift Cards as form of payment for online orders. We do not accept personal checks or money orders. All payment forms are subject to verification and review by USC Bookstores. We reserve the right to refuse to process any transaction, sale or shipment of orders due to unauthorized activity and/or suspected fraud. USC Regalia, Announcements, Class Rings, Frames (excluding sashes & tassels) are sold by Herff Jones. Please visit Herff Jones' FAQ for details. Custom Sashes are sold by Pride Sash. Please visit Pride Sash's Shipping Policy for details.